I'm going to give you an opportunity to get your hands on a fantastic book. Although the Internet has been with us for a number of years, most people do not utilize anywhere near the available opportunities on the Internet to help create the Perfect Lifestyle. 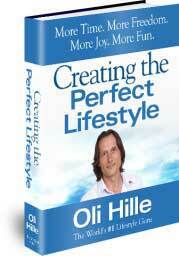 I have released a book on using the Internet to improve Income, Influence and Lifestyle. I have been earning my living in, on and around the Internet since 1999. I have spent thousands of hours and tens of thousands of dollars on programs, books, advertising, websites, tools, and applications. In my book I have distilled the knowledge and experience I have acquired. This is a MASSIVE shortcut for you to utilize the power of the Internet for Business, Lifestyle, Influence and Income. You can buy the book from Amazon for just $4.97 (note you do NOT need a Kindle or Ebook reader, Amazon GIVES you the FREE software to read the book on your computer or phone).